Drug-free-zones, though arguably filled with good intentions, have shown themselves to have unintended consequences. One of those consequences is that folks who otherwise pose no threat to anyone find themselves the victim of mandatory minimum sentences and escalations to infractions that would otherwise only result in light sentences or even fines. For instance, in Tennessee, a college student was given a 17-year sentence under drug-free-zone laws, a sentence that would otherwise average two to three years. Now, Florida lawmakers are considering the impact of these “tough on drugs” laws that are purported to keep children safe but arbitrarily inflate sentences and can even escalate misdemeanors to felonies. With over 2,300 Florida inmates imprisoned under drug-free-zone laws, the state is weighing the value of harsher sentences in terms of the cost to taxpayers. 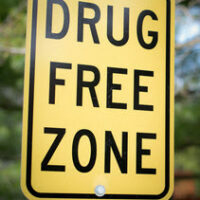 In some instances, individuals may not even be aware that they are in a drug-free-zone. In other instances, their homes can lie in drug-free-zones. Sometimes, drug-free-zones overlap with other drug-free-zones to create larger and more nebulous drug-free-zones. Entire communities may find themselves classified as drug-free-zones. In addition, a radius of 1,000 feet in all directions around any of the aforementioned is considered part of the drug-free-zone. While you can’t be charged under drug-free-zone laws for mere possession, you can be charged for possession with intent to sell depending on how much of a drug you’re carrying on you. Often, prosecutors will charge defendants with “possession with intent” even for simple possession. They do this under the hopes of leveraging a stiffer plea deal. When they charge a defendant with PWI in a drug-free-zone, the potential to face an unfairly stiff sentence is escalated dramatically. Now that drug-free-zones have successfully done what they were intended to do – put people behind bars for a very long time – they seem to have worked too well. Lawmakers are debating the merits of stiffer sentences largely because it’s simply costing too much money to house and feed prisoners for the amount of time they’re facing. In addition, these laws appear to have unfairly targeted black communities where “drug-free-zones” essentially leave no space anywhere for non-drug-free-zones. As a consequence, 8 out of every 10 Floridians convicted under DFZ laws are black. What’s clear is that the laws have done very little, in fact, to reduce crime. Hopefully, lawmakers will revise the law with fairer sentences and focus on prevention instead of punishment. Have You Been Accused of a Drug Crime? Drug convictions in Florida are a serious offense. If you’ve been arrested and charged with a crime, please contact Skier Law Firm, P.A. of West Palm Beach, and we’ll begin discussing your defense immediately.